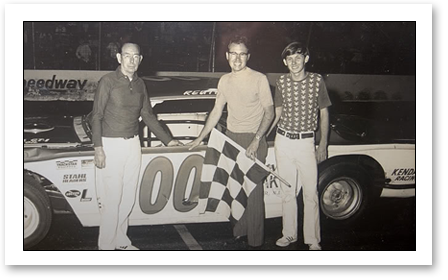 One of the most popular of all the dirt-track Modified stock-car racers, Emil “Buzzie” Reutimann of Zephyrhills, Florida, enjoyed a lengthy career on the Northeast’s short tracks and his résumé includes several major victories and track championships. He is also remembered for the “GO FIRST CLASS” motto on all of his “Double-O” racers and being the last to field a winning 1937 Chevy coupe in dirt-track Modified competition when everyone else in the mid-1970s was turning to Gremlin- and Pinto-bodied race cars. A second-generation racer, the bespectacled Reutimann (May 7, 1941) – who got his nickname when nurses in the hospital heard the newborn making “buzzing noises” – first began racing at age 13 in a black 1939 Ford coupe that he found behind his father’s Chevrolet dealership and updated with a Sears-Roebuck rebuilt engine. After learning his craft, young Reutimann inherited his father’s No. 00 1935 three-window Chevrolet coupe – in which a full-race Chevy inline-6 truck engine was installed – and that served him well in Sportsman and Modified races from the late 1950s into the early 1960s. However, when “Buzzie” learned from Tampa resident and fellow EMPA Hall of Fame member Will Cagle of the big purses being offered in New York, New Jersey and Pennsylvania, he brought the first of his signature red, white and blue No. 00 1937 Chevrolet coupes to the Northeast and started a career that made a major impact on dirt-track Modified racing. The “seasonal resident” of Asbury, New Jersey – who would return to Florida in the winter to race Late Models – won the 1966 championship at the old half-mile East Windsor (N.J.) Speedway. He won 33 races at the old half-mile Nazareth (Pa.) Raceway and its 1972 & 1973 track titles, and had 33 victories at the 5/8-mile Orange County Fair Speedway in Middletown, New York, to go along with the “hard clay’s” 1972 & 1974 championships. Major extra-distance victories include: the 1970 Daniel Boone 200 at the old Reading (Pa.) Fairgrounds: a 150-lapper at the old 1-1/8-mile Nazareth (Pa.) National Speedway in 1971; the 1972 Eastern States 200 at OCFS; the first two Schaefer 100s (1972 & 1973) at the New York State Fairgrounds in Syracuse – the event now known as the Super DIRT Week 200; and, the 1975 National Dirt Track Championship 200 at the old Flemington (N.J.) Fair Speedway. But Reutimann did not limit himself to dirt-track racing as he also ran a No. 00 Chevrolet Camaro in several asphalt events. But his most famous paved-track effort was in 1973 at the old 1/5-mile Islip Speedway out on Long Island when he defeated many of the best asphalt racers in the All-Star Racing League 100 with his trusty dirt-track Modified 1937 Chevy coupe. Like many of the professional racers of his era, Reutimann built all of his own cars and when Modified chassis changed from reworked mid-1950s Chevrolet frames to production-built 2 x 4 items, he “Reutimann-ized” those purpose-built offerings to meet his own specifications. Reutimann is also credited as the first to install a power-steering system in a dirt-track Modified. And when he eventually stopped building Modifieds with classic 1937 Chevy coupes his traditional red, white and blue No. 00 rides used Chevrolet Vega or Gremlin-styled bodies. In 1985, Reutimann suffered serious head and neck injuries in a grinding Turn-4 crash at Syracuse, but he recovered and returned to race 11 more years. However, after 31 years as one of the sport’s top stars, “the Buzz Bomb” retired from Northeast dirt-track Modified racing after the 1996 season and went back to live full-time in Florida where he continues to race and win in his No. 00 IMCA Modified. And when not doing that, “Buzzie” Reutimann is frequently seen on the NASCAR Cup Series circuit with his driver-son David. He stood in Victory Lane at Florida’s East Bay Raceway Park. It was Saturday, October 3, 2009 and he was there because he had driven a hard race in his open wheel Modified. He was there as the winner. He is Emil “Buzzie” Reutimann, a man who has made a name in racing in two regions of the country. If you say his name in Florida, people know it. You can say it in New York and Pennsylvania and get the same response, even though he hasn’t raced there competitively in many years. Some in the New York and Pennsylvania region will claim him as their own. In reality, he was born in Florida, where he resides today. It’s like the Alabama Gang – the Allisons and Red Farmer weren’t born there, but migrated there in search of racing. Such was the case for Buzzie Reutimann. He left the family business behind, but he was already an established racer when he answered the call of the road. His father, Emil, was a formidable racer in the region in the ‘40s and ‘50s. Buzzie went along and watched his father. Seeing the racing action and living next to the Zephyrhills Auto Company made his desires easy to figure out. By the age of 13, Buzzie said, “I can do that.” So his father told him to build a race car. He took a ’39 Ford and went to work. The original engine had to do for now, though there was a store-bought Sears engine in its future. And that’s where the number “00” came from. It’s a number that Buzzie and son David carry to this day. You’ll sometimes see a letter with it. In the case of Buzzie’s first car, it was B (for Buzzie) 00 and the car was called the “boo” car. It didn’t take long for the booing to echo from the stands as Reutimann got better and better at it. The first race for Buzzie came at Silver Dollar Speedway in Lakeland, Florida, where he started seventh and finished fifth. It was quite a workout and, even though he was young, he was winded at the finish of the event. Heavy stock cars of the period weren’t blessed with power steering or any aspects to make the chore easy. Realizing Better Success at Racing. By now, you’re thinking “Buzzie” came from his ability to buzz around the track and sting the competition. Actually, he was Buzzie at a very young age when nurses at the hospital noticed him making a buzzing sound right after his birth in 1941. He’s been Buzzie ever since. Buzzie raced through his teen years and really picked up the pace upon graduation from Zephyrhills High School, where he played a little football, but realized he could have better success at racing. Buzzie was a frequent competitor at the North East Tracks. Only making one start in NASCAR’s Premiere Series, NASCAR has still played a big role in Buzzie’s life. Before making his trip up north, Buzzie had competed in a NASCAR race. It was held at Florida’s Golden Gate Speedway, one of Buzzie’s regular stops. Richard Petty won it…Buzzie finished in the top 10. When Buzzie was in Florida, he was racing mostly paved tracks. His journeys to the Northeast saw him racing mostly dirt tracks. A racer had to be versatile and he could do it all. NASCAR eventually played a critical role in Buzzie’s life, a role that is ongoing today. 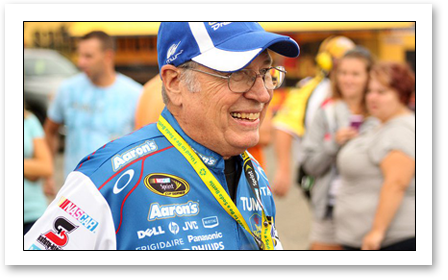 Buzzie is the father of current NASCAR Sprint Cup competitor David Reutimann. In many ways, the relationship between Buzzie and David was exactly like that of Buzzie and his father. Emil Sr. didn’t just give his son Buzzie anything he wanted. He intentionally kept the power down on Buzzie’s car, giving the youngster a chance to learn everything before picking up the speed or moving up to the Sportsman class. In the same respect, Buzzie started David’s auto racing with a Pontiac Sunfire, a four-cylinder car that David, along with his friend and current Sprint Cup crew chief Brian Pattie, had to build and maintain. Through this exercise, David learned how to weld for fixing and repairing. “You didn’t just go to the bank and get money for high dollar parts. You fixed what you could and when you could, you fabricated the rest”. The abilities to fabricate and address mechanical issues can go a long way in a racer’s career. The learning didn’t stop in the shop either. 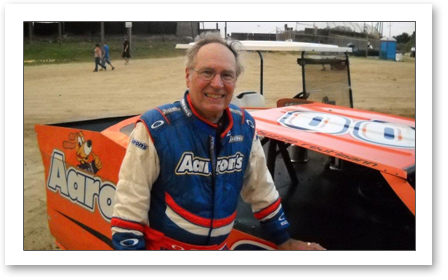 While David is driving at places like Charlotte, Kansas, Michigan and California, Buzzie recalled the fun he had traveling with DIRT motorsports or the All-Star League while in the Northeast. The region featured a number of special events, many still running to this day. There were special races at the mile at the New York State Fairgrounds in Syracuse, the National 100 and the Eastern States 200 at Middletown, New York’s Orange County Fair Speedway. He’s been in the field and even picked up a few wins along the way. In fact, he had an invitation to compete in the 2009 Eastern States, but turned down the ride simply because he hadn’t driven that type of car in a few years. He was supposed to have made a return to Middletown in July for a reunion event, but that was rained out. When you encounter a man who has been racing for 55 years, the tendency is to ask about a rival, a favorite track, a memorable win. Buzzie is smart enough not to single out anyone in this case. His racing these days is on a 3/8-mile track. He’s raced smaller and he’s raced larger and he doesn’t have a preference. Or maybe he does. There are over 1,200 features that he did win. It’s a rough estimate and may even be 1,300 by the time you read this. The October victory at East Bay was his second Modified feature win at the track. The class has been dominated by one driver, who has 9 wins in 13 starts. Buzzie and one other competitor, Shane Burrows, have the other two wins. Buzzie getting ready to “put on a show”. The attitude of today’s racer in the pits is different. We’ve heard stories of racers playing practical jokes or mind games for competitive advantages (Buzzie once painted his springs a different color every week to make competitors think he was doing something different). Not anymore. Part of the blame rests with the demise of racing promotion. More tracks are run by operators, ones who maintain a facility and open the gates, but don’t do anything about beating the drum or entertaining the fans once they are inside the gate. When a race track doesn’t succeed, either a new “promoter” is found or the place closes. Buzzie has seen his share of race track closures and the effect it can have on the sport. In Victory Lane at East Bay Raceway Park. Buzzie’s October feature win was entertaining. Starting in the sixth position, with point leader Mathews inside that row, the15-car field set out for a 15-lap main. There wasn’t much passing in the first three laps, but it heated up after that. Just before halfway, Buzzie had moved outside to take second. With Mathews inside, the two raced side by side with contact on occasion before Mathews left the track with a tire problem. Buzzie made his pass for the lead, again on the outside, with five laps to go. Within minutes, he was on the cell phone, talking to David, who is his car owner. Buzzie’s latest car is a departure from the red, white and blue tradition. This car, sent to David and Brian Pattie after Buzzie wrecked it at Volusia Speedway Park, carries an orange and black body. The colors are there to commemorate Zephyrhills High School, the alma mater of Buzzie, David and Brian. “The next one will be red, white and blue,” Buzzie said. Buzzie and David at the rain shortened Sprint Cup race that David won in May. Buzzie isn’t chasing points, but he’s chasing enjoyment. Whenever there is an opportunity to watch David in person, Buzzie will be there. Father and son talk twice a day, every day. Sometimes, they talk about a special day in May. East Bay was supposed to run Modifieds on May 23. Buzzie was leaning toward competing, but the weather was not in his favor. By late afternoon, he hedged his bet, believing the track would rain out and headed toward Charlotte for the NASCAR Sprint Cup race. East Bay did rain out, but so did NASCAR on Sunday. It meant Memorial Day Monday would be race day and Buzzie stayed. It was another good decision. Many of you already know the outcome. David won the rain-shortened race, giving him his first Sprint Cup victory and putting a Reutimann in the record books. The last time David and Buzzie competed was earlier this year at Talladega Short Track and David was the winner. “He had better tires,” said Buzzie. Buzzie Reutimann is a man torn between his love of racing and his love of watching David race. Which would he rather do? And so the question goes unanswered as does the one about when Buzzie will step out of the car for the last time. “I’m 68 now, so I guess I’ll stop when I’m 70.” The laugh that followed indicated that we can’t put much stock in that answer. He’s in the DIRT motorsports Hall of Fame, inducted into the Eastern Motorsports Press Association Hall with his good friend Darrell Waltrip (whom he represented at the induction) and has a list of accolades that can fill the Zephyrhills race shop and then some. He’s the man who purchased the first barrel of racing fuel from Sunoco when they got in the business over 30 years ago. He’s still winning and making fans and friends wherever he goes. He’s Buzzie Reutimann and that’s all you need to know.